Having been one of the most entertaining teams in baseball for the past two seasons, the Kansas City Royals seemed to have up’d their game, recently, winning via thrilling comebacks in the latter innings of games. Sunday, Mike Moustakas came up huge, knocking in two runs with a double in the ninth inning to secure a win over the Boston Red Sox, which knotted up the series at 2-2 heading back to KC. Monday night, It was Moustakas again, this time in the sixth inning down 3-1, the Royals third baseman hit a three-run homer to right field with two outs to start what would end up finishing as a 7-run inning and an 8-3 lead. 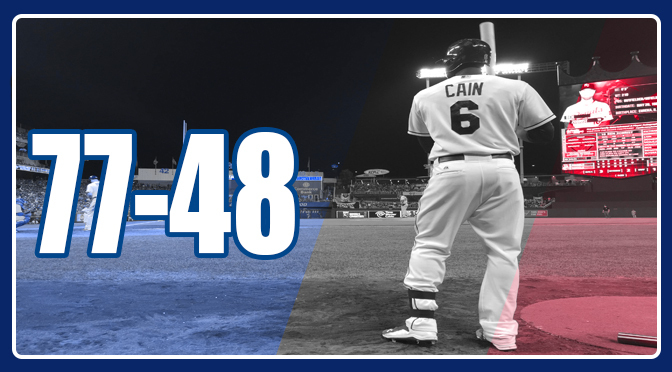 Lorenzo Cain had himself a solid night as well, going 3-for-5 with two RBI’s, both of which coming on a 2-run single into center in the sixth. The Royals are now 77-48 on the year and appear to be in coast-mode as the season winds down. Don’t mistake the word ‘coast’ with this team however, as their coasting seems to be winning baseball games however they can. The Royals have the best defense in baseball, and offensively, can score in a variety of ways. Last year in their magical postseason run, Kansas City became a home-run hitting team, which was completely out of the norm relative to their scoring throughout the regular season. This year, there is a better balance between the long ball and a team which can bang the ball around the field and manufacture runs. Conversely, Kansas City hasn’t seemed to use its speed on the bases as much this season as it did last. Whether or not Ned Yost calls for more base-stealing during the playoffs is to be determined, but the Royals possess the players capable of putting pressure on the opposing team by working the base path. The one question mark moving forward is what Yost will ultimately decide to do with the starting pitching staff. The rotation will most certainly include Johnny Cueto, Edison Volquez, and Yordano Venture–although depending on his next couple of starts, his status could change. The last two spots should come down to a battle between Danny Duffy, Chris Medlen, and Jeremy Guthrie, with the outside chance Chris Young could get consideration, but is unlikely as he hasn’t made a start in several weeks. Medlen has looked like a promising pick, while Duffy and Guthrie have had their struggles of late. Yost told media members Tuesday afternoon that they won’t make a decision on the 25-man playoff roster until they absolutely have to have it set. Tickets are on sale now for remaining games at Kauffman Stadium. Don’t miss your chance to close out the regular season with the boys in blue. Tickets For Less has amazing deals on great seats around The K. Visit Tickets For Less today and purchase your seats!